I am surprised that Chief Justice Roberts did not feel compelled to intervene for this hapless lawyer. Thankfully, Breyer had a human response. I am always a bit sensitive for lawyers slammed in this way before the Court. Justices as a whole do not have a great deal of litigation experience and often seem insensitive to the realities of lawyering, including the quite understandable level of nervousness that can take hold of the most seasoned lawyers in appearing before the High Court. It was a brutal moment as well as an unnecessary one. Scalia did not have to shred this man in front of Court. However, it reaffirms something that I constantly hammer away at in class. I tell my first year students in torts that they cannot read from notes when called upon to present cases and answer questions. I explain on the first day that I see many smart and talented lawyers in court who come in and read from notes. It is a bad habit that alienates judges and jurors alike. It also prevents a lawyer from reading the reactions of the court or jurors when they are staring down at their notes. This is a habit that I believe forms in the first year of law school, which is why I bar the use of notes in my class for presentations or answers. I ask the students to close their books and look at me. If they are reading from their computer, I will close the computer or admonish them to look at me. Once they get used to speaking in an unscripted fashion, they tend not to develop the habit to begin with. They are universally better when they let go of that crutch. So, I understand Scalia’s point while strongly disagreeing with his method. The rest of the argument reportedly proceeded without any further awkward moments. At issue are the rule governing cases where the government gives land away but then tries to get the land back. This evening on January 25th I am watching CSPAN and Justice Breyer is doing a lengthy interview. In response to a question he went into his suit coat pocket, pulled out his paper handbook size copy of The Constitution and responded to a questions. The small pocket version is not a prop as I stated in a comment above but is a great way to employ some notes in an oral argument. Also, a trial is way different than an oral argument on a motion or an appeal. In trial you are with jurors. Notes are a way of doing business and might be a method of making one’s case. Oral argument before an appeals court is different. I define the best lawyers as those that have a winning streak. I’ve observed those, and they use notes ALL OF THE TIME. In fact, during one trial in which I had the opportunity to observe one of the best criminal attorneys in the US in action, he not only USED notes during the trial, but he specifically told the jury that he uses notes and that a criminal trial is not like Perry Mason, Matlock, etc. where the attorneys just talk off the top of their heads throughout the case. Okay? And, oh yes, he WON. So STFU when you don’t know what you’re talking about. Notes should be allowed when presenting exact quotes of more than a few words and perhaps to verify case cites. A general outline ought to be allowed, but only because that should refresh the memory, not substitute for it, , particularly when a long presentation allows for losing one’s place. Otherwise, practice, practice practice! 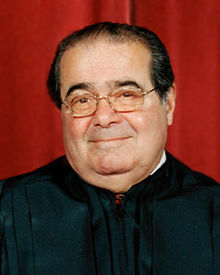 Watch for Google glass to throw Scalia into a coronary. Now That’s Funny, Right There. I Don’t Care Who Y’Are! That would be very, very not correct. I found a quote from a 1980’s book on Supreme Court etiquette by Rehnquist that said “this behavior is so egregious that it is rarely seen”. So your claim that the “BEST lawyers do it all the time” seems confused and unfounded at best. I’d say that’s pretty clearly stated. But if you have some evidence that the best lawyers do “do it all the time”, I’m all ears. With some of the lawyers I have seen, it is comforting to have proof they can read. Oral argument can begin in the cafeteria of the courthouse where the respective court of appeals sits. Or in the law library in that building. A crafty lawyer yaks up the court legal clerks and other clerks and the judges. The pocket size copy of the U.S. Constitution is visible in the jacket pocket and can open a discussion. Same with Objections At Trial. The story behind the ten, twenty, thirty year history of the pocket Constitution which one got in law school can travel a long way. This is not the day of trial or argument but on a regular basis. They did teach you this in law school did they not? Great story, mespo. I love oral argument, but was terrified the first time I faced an appellate panel. I quickly learned that having a prepared oral argument is not the same as being prepared for oral argument. I recommend two “props” for oral argument on a constitutional law case. A small pocket size copy of the Constitution and the pocket size three ring binder book Objections At Trial, mentioned above. If you discuss the 14th Amendment for example. Read the relevant provision from your little constitution book and then stick it back in your jacket pocket where it belongs. I had one that I bought in law school and carried it to court of appeal arguments with me and kept it on hand. Forty plus years or so. Of course, that was back before I was a dog. That book does not as yet have a section or footnote on the topic of Hearsay of The Dog. It is needed. If I was a human again and was teaching clinical law students again, I would discuss this blog article and our comments. Not all people who go to law school end up being “in court lawyers”. Few ever get to courts of appeals. But being able to stand up and discuss a case and all the law is important. One crutch which I use is calculated. If it is an evidence issue, whether at trial or on appeal, I carry my small pocket book called Objections At Trial. It is authored by Ron Carlson and two other guys. One is Judge Myron Bright and the third is Immwrinkelreid. I did use my crutch in front of the 8th Circuit Court of Appeals on time and guess who sat on the three judge panel. Yeah, I was stretching it. But this is my favorite law book. There is a 2013 version which came out last March. But, that was back in my law career and I am a dog now. All law students and all lawyers are not necessarily meant for court. Many lawyers never make it there (in several senses of the words “make it”). Scalia could have kept his astonishment at the lack of skill/style/awareness to himself, but as with the other example, we are all who we are (and that is him). As with everything, there is a lesson for all of us in the story. Itchinbay, I’m sure Charlie has been dead for decades, and I went to school in Pa. Everyone had to take speech and Charlie was the only speech teacher. If you wanted to graduate you had to go through Charlie. mespo, Kudos on being forthright and great anecdote. One of the first times I had to testify it was in front of a curmudgeon judge. I was sworn in and then went to take the witness chair. I fell and slammed my nose. It was bleeding and my eyes were watering. There were some Kleenex handy. The attorney who called me asked me if I needed a minute. The judge barked, “Proceed counselor.” It wasn’t personal as far as I know, it was my first time in front of this judge. Just a real prick. Judges run the gamut. I had a circuit court judge marry us on short notice. A great guy. I was quite nervous in my very first appellate argument before none other than the esteemed (around here anyway) U.S. Fourth Circuit Court of Appeals. I had re-read every case in this mundane bankruptcy action and knew the facts. I even knew which judges had written which opinions and was prepared to look uber good by mentioning that fact in passing. As we got into it, I recall freezing on the facts of one of the cases written by the most active questioner. When I finally got busted by the judge about the facts,I said, “Well, judge, you wrote the opinion so I didn’t want to rehash all the facts you already knew quite well.” We moved on. I’m curious how, first, Scalia’s comment can be taken as a brutal shredding of the man. It’s not like he dressed him down, he just asked if he planned to read his monologue. The court’s customs are pretty set against just coming in and reading notes. Then I’m curious how, second, someone who understands Scalia’s point but disagrees with Scalia’s method would have gone about remedying the situation? Totally agree with JT’s comments about teaching his students to do away with notes. Those who can: do. Those who teach should teach the law students from day one to not “pull the Lechner”. No, we are not talking Hannibal Lechner. But the reading from Notes at the Supreme Ct guy named Lechner. He will go down in history. It is like pulling the lever. When you pull the Lechner the trap door under your feet at the podium drops and you go into the cellar of the Supreme Court Building. Then you are taken out on a rail. Teacher Turley and others must teach this lesson tomorrow morning. Scalia is a bully and a provocateur pimp of the SCOTUS. He has a habit of intimidation while going around outside the court to give his opinions to the conservative gatherings of the cases being discussed in the court. Prof: JT: Although I agree with you about speaking without the notes, but that view contradicts the fast changing times to which we are forced to adapt to. The only difference in the SCOTUS is that they do not wear ugly white wigs anymore but carry on wearing “burkas” with their faces showing. It is a good idea to speak without notes. In order to do that, the first year of law school should not be the starting point. The kids who want to be lawyers should involve in debate teams from their middle school onwards and some magnet schools also offer mock trials in real courts at the same time. Both help them speak and answer questions without the notes. My son who is a freshman at college did both and very well I must add. He won all his cases at his mock trials and won all types of debating trophies, went to the nationals from his middle school onwards but has decided to be an astrophysicist by doing Phd in Physics. I wish him all the luck.